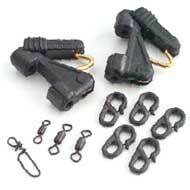 Designed for deploying live baits for Sailfish, Tuna, Marlin and other gamefish. completely waterproof, constructed of ripstop nylon material, won't mildew and it will fly wet. One kite is suitable for all types of wind conditions. available in two distinct sets that enable AFTCO kites to handle a complete wind range from four to nearly 16 miles per hour. And even without wind, the AFTCO kite can be slow trolled — or drift fished by attaching a helium-filled balloon to the kite’s special loops. Also featured is an easily adjustable bridle with no metal connectors to rust or break, plus a black with white logo design that is easily visible against any sky. 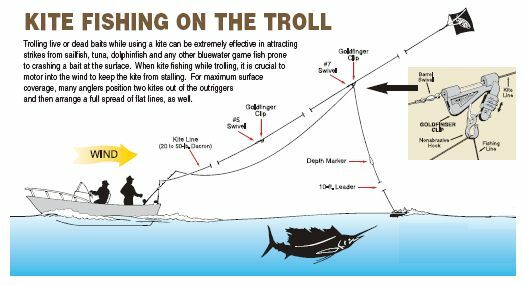 Though most commonly used to fish live baits for sailfish, dolphin fish and tuna, fishing kites are also extremely effective for baiting marlin, king mackerel, tarpon, sharks and even freshwater bass. 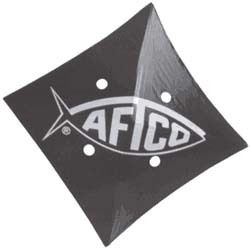 In fact, there are very few predator fish that can resist a live bait struggling (or a dead bait skipping) on the water’s surface — and the AFTCO Kite, when used properly, is the best tool for making a tantalizing surface presentation. 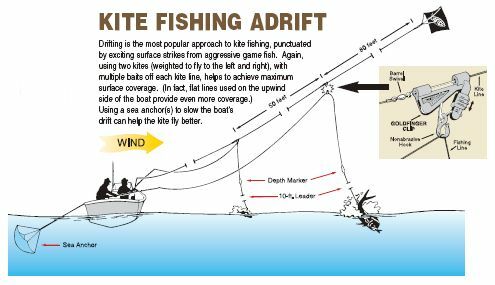 Weight them to fly left or right and AFTCO kites can be flown and fished in tandem.